My word for 2019 was “thrive” and so far, I’m not thriving very much. The year is off to a rough start but things are finally calming down. The last few weeks I’ve been trying to make some little changes to improve my life. Some changes that will help me thrive more than just survive. Grief has a way of keeping you from really living and I’m working hard to change that. 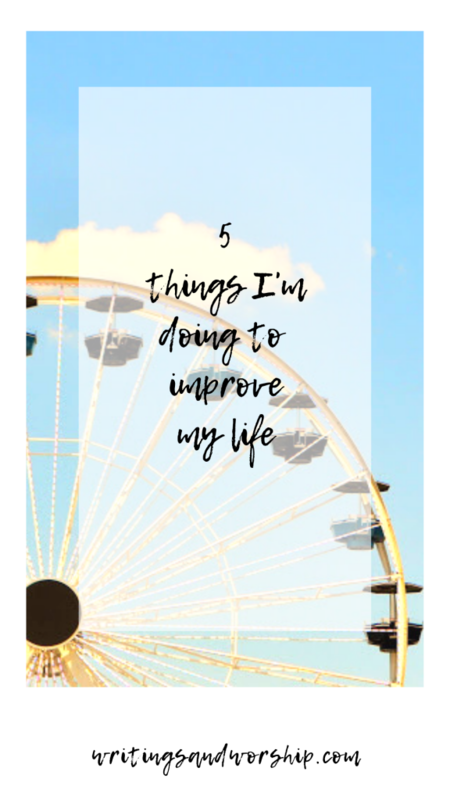 Today I wanted to share a few of the simple things I have been doing to improve my life. These are little things I have tried to adapt to and add into my everyday life to help me. I hope that these would help you as well. They aren’t major live chancing things…simple things you can start doing right now to better yourself and your life. I don’t want to sound like an over exaggerated self-help ad, but let’s improve our lives together! When you face a sudden loss, you realize what a gift every minute and every day can be and should be. After losing my dad, I had to face a lot of fear of waking up to someone else dead (Anxiety and grief is an awful thing). When my grandma was critical, I would wake up panicked every morning…but God showed me how to change that. Instead of waking up dreading the day or being anxious, I pray. I pray before I even get out of bed and thank God for another day and another calm night. So often we take our lives for granted…we don’t appreciate what waking up each morning really means. I started changing my attitude and being thankful and appreciate waking up to face a new day. I have been trying really hard to pray and be thankful before my feet even touch the floor. How many of us start prayer off with “God I need this, God can you do this…” I know I do! It’s our sinful human nature to go straight to what we want and what we need God to do for us. We are inherently selfish. God really showed me how selfish I was in my prayers. When God started doing miracles in my grandma and healing her from this awful infection…I realized how important it was to be thankful for answered prayers. I am currently working hard to start my prayer out with thanksgiving instead of going straight into my needs and wants. I have to remember that God isn’t just a genie that grants my wishes. He is a loving God that wants a relationship with us. He is a God that works miracles and answers prayers and deserves our thanks no matter what the outcome is. This could be a whole separate post and it probably will be. But for now, I’m really working on my anxiety right now. Before my dad died, I could control my anxiety fairly well. With techniques I had learned in counseling and lots of prayer and help from God, I was doing really well. But leave it to sudden death to shake up for life. Long story short, I’m trying to get my anxiety back under better control. I don’t want anxiety to control me so I’m working on it. Anyone else been there? I know that anxiety can hold me back from so much, so I know if I want to improve my life and wellbeing…I need to kick my anxiety to the curb (or at least far away from the front door). Are you interested in a whole post on this topic? Let me know in the comments. I love to read. I am a complete book nerd. But I couldn’t tell you the last time I actually picked up and finished a book for pleasure or learning. It has just taken a back seat in life. But it is something that I really enjoy and it gets my creative juices flowing. As a writer, reading is a huge part of my creative process and that has been lacking in my life. I am really trying to get myself back into reading because it honestly does improve so many areas in my life. Also, I am really trying to utilize my local libraries! That improves my life because it saves me money- never forget about your library! I know this seems to be on every single persons New Years resolution list or to-do list, but really. Water is so vital and I am really trying to drink more and more water and less of everything else. It’s amazing how crappy you feel when you aren’t drinking enough water. I can always tell when I’m not getting enough and that’s why I am really trying to incorporate into my daily routine. Water is essential and I know drinking more would really improve a lot of areas in my life. What do you like to add to your water? Do you like lemon or mint in it? Give me some ideas! These are just a few, simple things that I am doing to try and improve my life. To improve my overall well being, health, and mental health. What are some ways you are improving your life? I’d love to know!